Morphix Technologies® will be displaying its TraceX® Explosive Detection Kit and Chameleon® Chemical Detection Armband at Booth #739 in San Diego, CA, April 18 – 19, 2018. Virginia Beach, Va. (April 2018) – Morphix Technologies®, an innovator in the science of detection devices for dangerous chemicals, will be exhibiting at Warrior® Expo West, April 18 – 19, 2018 at the San Diego Convention Center in San Diego, California. Morphix Technologies will be exhibiting its TraceX® Explosive Detection Kitand its Chameleon® Chemical Detection Armband at Booth #739. “Warrior Expo West is a great event that brings together end users, program managers and procurement specialists in one place to try out thousands of solutions. We are looking forward to exhibiting what the TraceX and Chameleon detection devices can do to help our warfighters and First Responders complete their missions,” commented Kimberly Pricenski, vice president of sales and marketing for Morphix Technologies. 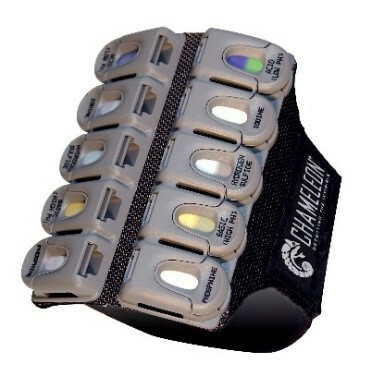 The Chameleon Chemical Detection Armband is an easy-to-use, inexpensive, wearable, reusable armband that can hold up to 10 cassettes, each of which detects a particular toxic chemical and changes color upon detection. One color indicates the absence of toxic gas. When two colors appear in the window, the user knows it is time to take action. Designed for use in the arctic, tropical and desert conditions, the Chameleon Chemical Detection Armband can even be immersed in water. 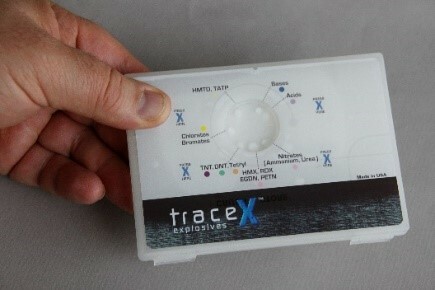 Morphix Technologies has prioritized its product development based on the advice of the U.S. military and law enforcement agencies, so the Chameleon Chemical Detection Armband cassettes are available for many of the high-risk Toxic Industrial Chemicals (TICs) identified by the U.S. government. It has also been approved by the U.S.
SAFETY Act of the Department of Homeland Security as an anti-terrorist technology. Warrior Expo West is designed specifically for government and defense organizations. It is far more than a simple trade show – it’s the defense industry’s one-stop-shop for industry networking, customized training and product demonstrations. The Expo attracts 300+ industry suppliers and more than 3,000 vetted attendees, including active duty military, federal, state and local government agencies, law enforcement, first responders, qualified defense or government contractors and exhibiting partner suppliers or manufacturers. Visit the website at www.morphtec.com to learn more. This entry was posted in CBRN and tagged Chameleon, Morphix Technologies, TraceX. Bookmark the permalink.